For some reason bears are always hungry. Even if you think that you feed them well. 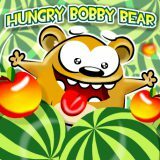 Feed this voracious Bobby Bear with different juicy fruits! Delete objects that prevent the fruits from falling into the mouth of this cute big-eyed bear!